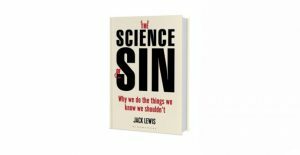 As my new book The Science Of Sin essentially argues that increasing a person’s sense of social connection improves their health (compared to social isolation), it occurred to me that we should start to label tech companies according to whether their overall impact on the depth of people’s sense of being socially embedded in a supportive community is improved or harmed by regular engagement. I’ve invented some hashtags in the vain hope that people might start playing the game of thinking about the impact of the technologies they use on their own sense of social connectedness and use #socialXplus to denote an opinion that it is a force for increasing the sense of being meaningfully connected with others (e.g. Twitter #socialXplus) and #socialXminus to tag those social media companies that despite seeming to promote social connections actually have the opposite effect (e.g. Facebook #socialXminus). That said, I won’t be holding my breath waiting for it to go viral! Anyway, let’s consider the cases of Hotels, Hostels and AirBnB. In a hotel you are, by definition, crammed in with all the other guests, many of whom you wouldn’t want to get stuck talking to for very long, if you could possibly avoid it. For these reasons, and others, the average guest is likely to hurry by in any given corridor, do their best to avert their gaze while stuck in a lift with you and carry on with their business with as little actual direct communication as possible. Sure, there’s the occasional exchange of pleasantries, but rarely do these result in what might be described as a meaningful social interaction. 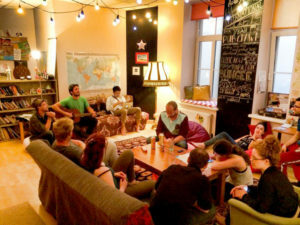 Backpacker hostels across Africa, Asia and South America are a completely different offering. 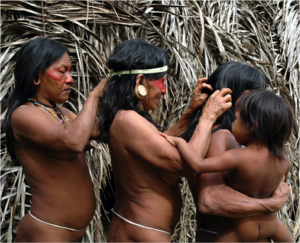 With everyone brought together by relative poverty compared to other visitors to the country who can actually afford to stay for an extended period in a hotel, the banter tends to be lively and all-inclusive. (That their relative poverty is positively lavish by the standards of most local people’s annual income is another matter for another day.) The point is: the usual sharp invisible borders wordlessly drawn between people from different levels of socioeconomic status in the developed world become blurred when you’re all bunk-bedded up in a 16-man & -woman dorm at the mercy of other people’s common decency regarding night-time emanations of light, sound and odour, breaking down many of the usual social barriers as a direct result. I’ve done a lot of traveling in my time, doing my best to stray from Lonely Planet recommendations wherever possible, in an effort to maximise my interactions with locals and the more intrepid adventurers. When I’ve been lucky enough to be put up in nice hotels by my bigger clients I try to wear the comfort of the facilities and the obsequiousness of the staff lightly. Don’t get used to it, I tell myself, focusing instead on directing my attention to how my fellow guests interact with those they encounter. I very much subscribe to the idea that you can glean much more about what a person’s really like from observing their interactions with others, rather than relying just on how they comport themselves with you. I’ve noticed that those who take the time to be polite and friendly to all, even those employed to serve them, are not as common as they once were. I’m in Copenhagen as I type, staying in an AirBnB, tapping this into my laptop with the rare September sun streaming through the window and a swirling wind violently whipping the leaves of the plants on the balcony in time with the drum ‘n’ bass beats streaming from my laptop (Goldie, Strictly Jungle, 1995 – in case you’re curious). Earlier today, I had to ask three people where the nearest cash machine was until I finally tracked it down. And I also ended up asking a woman in the supermarket whether the carton I had in my hand was milk (because late last night, starving hungry, I ended up having a very sickly bowl of cereal because I’d accidentally bought a carton that looked very much like milk, but was in fact full cream!). My point is, as much as I wasn’t relishing the prospect of having to rely on the kindness of others to get what I needed doing done, it was ultimately great to have had some interactions with local people. I felt buoyed each time and it made me feel more at home as a stranger in a foreign country. These are minor moments of #socialXplus but ones that are worth mentioning all the same. The main boost this trip is giving for my sense of social connectedness (#socialX) is that I’m here to give a lecture as an excuse to spend time with two neuroscience buddies from my PhD days who are based here in Denmark. AirBnB quite literally made the trip financially viable, whereas if I’d had to stay in hotels I’d have flown in and out with one overnight stay, as the hotels in Copenhagen are outrageously expensive! There are also important #socialXplus opportunities on the other side of the equation. My host this time is staying at her boyfriend’s place so her interaction with me has been minimal. But the last time I stayed the night in an AirBnB it was on the outskirts of Bristol and the circumstances of my host were very different. We were in her spare room and it quickly became apparent that she often forged friendships with guests that she “clicked” with. She was a bouncy, vivacious, 45-year-old, full of West Country hospitality, enthusiasm and charm. She immediately invited us to have a cup of tea and join her on the sofa to watch the tennis (Wimbledon was on). Later that night my girlfriend came back to our AirBnB at midnight (while I continued on at the party hosted by another bunch of old university friends) and they ended up having an hour-long chat over a glass of wine. In the morning we tiptoed down to the kitchen / lounge to find the patio doors had been pulled back to reveal a beautifully-kept, wide, lush garden complete with pond, rock garden and seating area. She was up a ladder trimming the hedge in glorious sunshine, but immediately beckoned us to sit down and have some lemonade. She made us feel very welcome and all parties benefited from the social intimacy that the arrangement evoked. 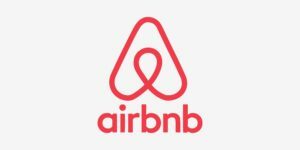 It is for these reasons that I offer AirBnB as a technology company that is a clear and unequivocal source of #socialXplus … helping humans to form social connections, helping them feel embedded in a community. 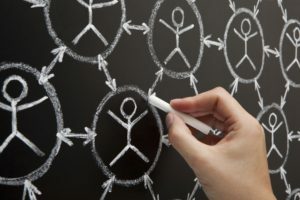 And by bolstering their sense of being socially connected, albeit briefly, it should reduce their feelings of social isolation which might otherwise have increased their chances of getting cancer, cardiovascular disease, psychosis and depression according to a series of peer-reviewed scientific articles that have been accumulating in the literature since 1988. In addition to these monthly blogs, I tweet interesting brain articles (@drjacklewis), do a regular science podcast with the divine Lliana Bird (Geek Chic’s Weird Science) and am on the verge of launching a brand new YouTube channel where I take people in Virtual Reality adventures….